Podbean has partnered with Samson for the purpose of holding a giveaway. 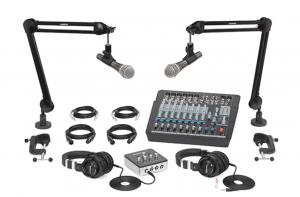 Someone will win an awesome podcasting set up. They will be giving away a podcasting recording solution every month for 3 months, beginning in August of 2017. Podbean is an easy and powerful tool for beginner to advanced podcasters, offering hosting and publishing services and an array of podcaster tools. It offers affordable, powerful media hosting and simple-to-use publishing tools. Additionally, Podbean integrates monetization services to help podcasters create income streams from their podcast. Samson Technologies is an industry leader in both consumer and professional audio with three notable brands: Samson Audio, Samson Wireless, and Hartke. Samson introduced their first wireless microphone system in 1980.